How the ceremonial use of ancient medicine helps artists tap into their creativity. I came to the remote Amazonian village of Puerto Miguel on a backpacking trip with Operation Groundswell. We lived with local communities and helped on local projects. It ended up being a life-changing experience for me. I’d been wanting to come to the Amazon since childhood. I grew up in East Africa and backpacked in many places around the world before coming to Toronto to study. Living in such a big city made me want to reconnect with nature and my roots. The indigenous people I encountered in Peru were far more connected to nature than anyone I’d ever met. It amazed me how well they knew the plants, the animals, the fish – and how harmoniously they lived among them. 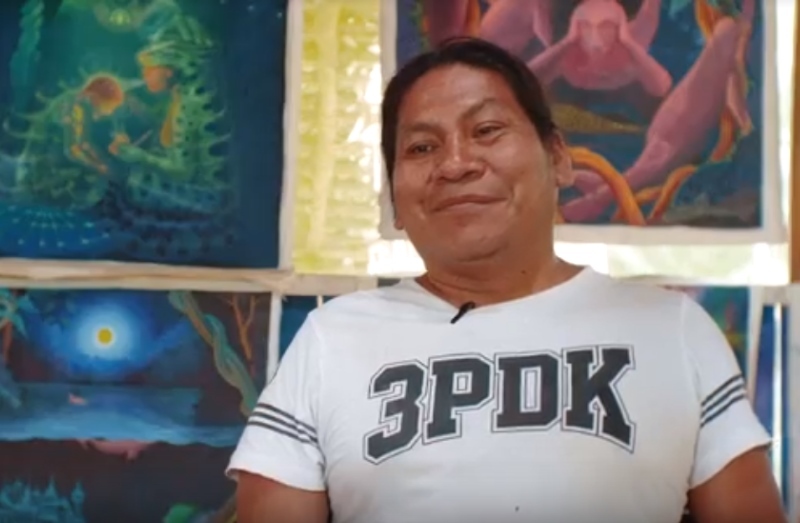 At the visionary art school in Puerto Miguel, I saw how the ceremonial use of ayahuasca was helping the artists tap into their creativity and inspiration. Luis, a visionary artist at the center, told me, “When you are an artist, you have no limitations. You can portray the world any way you like.” Being freed from limitations has really expanded my vision and capabilities as a filmmaker. This short film is part of my documentary La Pachamama: A journey of reconnection, a story about indigenous leadership that aims to inspire student leaders to take action on climate change. Editor's note: Be aware, if you're on drugs (natural or not), you could put yourself in danger. A true global villager, Jigar has travelled to five continents and speaks six languages. His passion for filmmaking derives from his curiosity to uncover world issues and give a voice to minorities. Spending weeks with the shamans of Peru’s Shipibo tribe, photographer Vincent Roazzi, Jr. finds that reality is not as finite as it seems. Videographer Andrés Brenner discovers why an Amazon community chose conservation over tradition. Peru's Amazon rainforest offers stunning biodiversity and an enormous range of adventures. Here’s how to navigate your choices.